Bilberry, a dark fruit rich in antioxidants, works to treat gastrointestinal ailments such as diarrhea. Find out more about its benefits and uses. Bilberry, a herb originating in the temperate regions of the Northern Hemisphere, has been one of the world's most popular berries for centuries. It is believed that they were originally independently domesticated over a millennium ago in Europe, Asia, and North America, where they now grow wild. With the arrival of pharmaceutical technologies, bilberries have become prized more for their sweet flavor than their medicinal potential. Nowadays, they are mostly seen as a low-calorie snack that contains immense nutritional value. Lowering blood pressure. Bilberry has been shown to reduce leakage in the blood vessels in the eye, thus helping prevent and treat age-related macular degeneration. Reducing blood sugar levels. 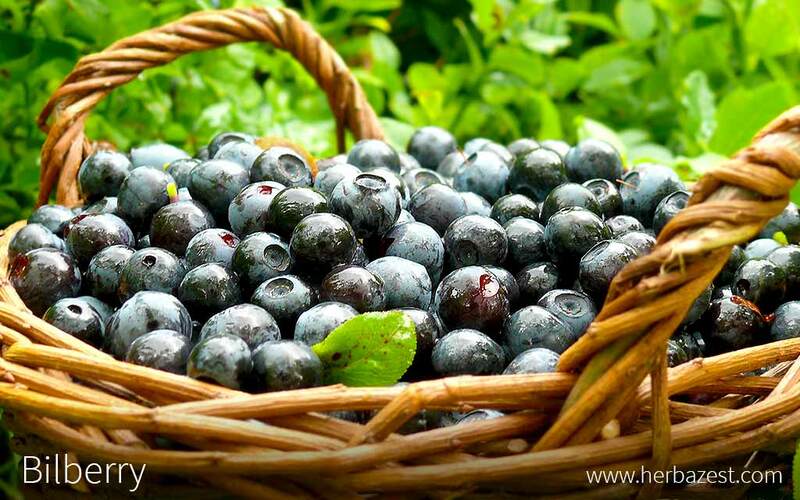 Bilberry leaves help increase insulin sensitivity, allowing the body to control blood sugar levels more efficiently. Stopping diarrhea. Bilberry's antibacterial properties allow it to help reduce bouts of diarrhea. Preventing diabetic retinopathy. Bilberry may be able to reduce compounds that contribute to diabetes-related retinopathy. The anthocyanins found in bilberry extract have anti-inflammatory and antioxidant action, and they have been shown to increase circulation, lower blood pressure, and help maintain flexibility of the arteries. Bilberries do seem to be able to lower eye blood pressure and thus prevent retinopathy; their beta-carotene content can treat vitamin A deficiency, which is a common cause of night vision atrophy. Bilberries also contain pterostilbene, as well as tannins and flavonoids. The nutritional value of bilberries also includes vitamin C, beta carotene, and fructose, a naturally-occurring form of sugar that is digested slightly more slowly than sucrose. The anthocyanins in bilberry are also responsible for the deep blue-purple hue. Other herbs with hypoglycemic properties are graviola and yacon, while goji berry and saffron share similar hypotensive effects. There are no known side effects of bilberry. However, experts recommend that bilberry leaf and extract not be taken over an extended period of time due to their tannin content that may lead to severe weight loss, muscle spasms, or death - although no cases have been reported relating to bilberry specifically so far. It is also believed that bilberry may alter the efficacy of other medicines or vitamins, namely blood thinners and diabetes medication. Raw. Fresh bilberries' sweet flavor and high antioxidant content can be obtained by using them in sorbets, sauces, pies, and many other culinary preparations. Decoctions. A decoction made by brewing 20 - 60 grams of dried berries is the go-to bilberry preparation for countering diarrhea. Powder. In this supplemental form, bilberry can be added to water, juices, or smoothies for stopping diarrhea, as well as for the regulation of blood sugar and arterial pressure. The flavor of bilberry is compared to that of fruits like strawberry and cherry. Liquid extract. Obtained by distillation, this preparation contains more anthocyanins than bilberry food products. Capsules. Bilberry capsules and extracts are typically standardized to contain 25% anthocyanins, making them the most consistent preparation. Raw bilberry is easy to find in most grocery stores or local markets around the world. Though they are only available to be picked from July to September, they are available as frozen raw bilberries for the remainder of the year. Bilberry sauce or syrup, or other forms of it, are not as common but may still be found in some stores and markets. Bilberry extracts and capsules are mainly found in specialized health stores and online retailers. Bilberries are hard to cultivate, which is why they are mostly gathered from the wild. However, they can be grown in a controlled environment, under specific conditions. Slightly acidic soils are required for bilberries to grow best, with a pH range between 4.5 and 6.0. Bilberries should be planted indoors during early fall and transplanted after the last frost date. The seedlings should be planted under partial shade to full sun. Extensive care should be taken, since bilberry plants are highly susceptible to pathogens. Because of differences between regional usages, it is important not to confuse bilberries or "European blueberries" with "American blueberries," since both their appearance and names are deceivingly similar. Bilberry bushes tend to be shorter than those of American blueberries, and the bilberry fruit is usually solitary, while American blueberries grow in bunches. Although both plants are nearly identical at first glance, bilberries can be recognized by their dark red flesh and juice, whereas American blueberries tend to turn blue quickly. In addition, American blueberries have a translucent or white flesh, which can help tell them apart from bilberries. Bilberry is a species of the genus Vaccinium, part of the Ericaceae family. This is commonly known as the heath or heather family, and it contains 4,000 species split into 126 genera. This family includes many important berries in the culinary and herbal medicine industries, such as blueberry (Vaccinium corymbosum) and cranberry (Vaccinium oxycoccos). Vaccinium myrtillus is the species most commonly found and cultivated of all Vaccinium species with the common name of "bilberry." While V. myrtillus has no identified subspecies or varieties, it is sometimes referred to by its botanical synonym, V. yatabei. Throughout history, bilberries have been used for a range of different medicinal purposes. Native Americans, for example, held the plant in high esteem as a herbal remedy for different and seemingly unrelated illnesses. Later, in the 12th century, the fruit was commonly recommended as a way of inducing menstruation and solving "women's ailments." By the 16th century, bilberry became a popular treatment for curing diarrhea, and during the 18th century, bilberries were widely described in herbals and medicinal treatises as a cure for intestinal disorders and mouth ulcers. Bilberry is very popular in many foods, and therefore, it is in large demand in the alimentary industry. However, due to its medicinal benefits, it is also highly sought in the herbal remedy world. Bilberries are extremely difficult to grow, so they are collected from the wild rather than cultivated. They are plentiful in Northern Europe, especially in Sweden, where 20% of the unoccupied land is covered in bilberry bushes. During World War II, interest in the properties of bilberry was revived by the British Government, who spread the rumor that bilberries were responsible for their night pilots' unusually sharp vision. This rumor was fabricated to conceal from their enemies the fact that they had developed radar technologies. Personal care products. Some manufacturers use bilberry's essential oils in the production of shampoos and soaps. Dye. Due to their anthocyanin content, bilberries have also been used as a blue dye, as well as a colorant for wine and liqueur. Germplasm Resources Information, Taxon: Vaccinium myrtillus L.